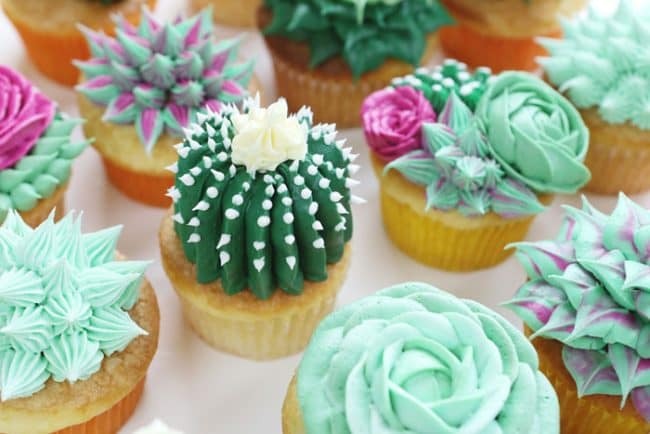 These Succulent cupcakes are a fun to way treat anyone who loves succulents! Imagine inviting the kids to help and creating memories as well as delicious cupcakes! Check out my other Cupcake Recipes too! Begin by baking cupcakes and allow to cool to room temperature. Prepare your buttercream. 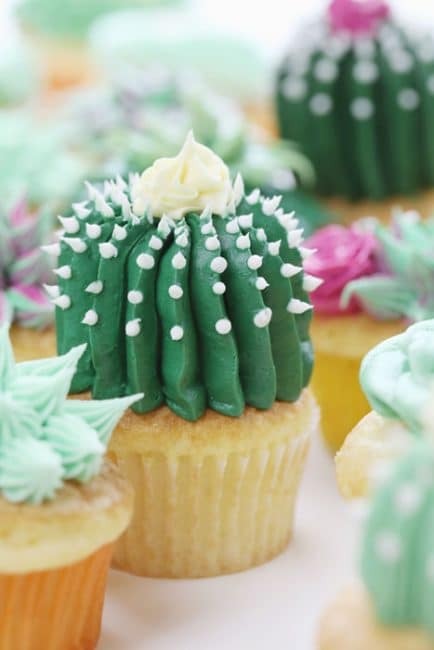 Now you can tint your frosting for the succulent cupcakes. I did 3 shades of green; a light, medium, and dark tone. I prepared a dark pink (mauve) and a yellow, then left a little buttercream white. Place all frosting in pastry bags fitted with coupler sets. Begin by piping out a tall center tower of frosting. 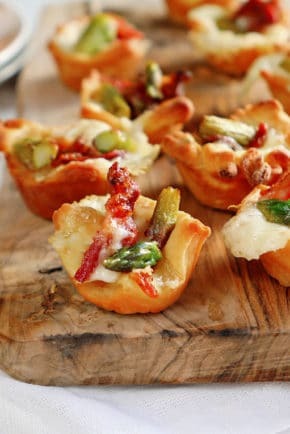 (You can also place a mini cupcake or donut ball on top of the cupcake. 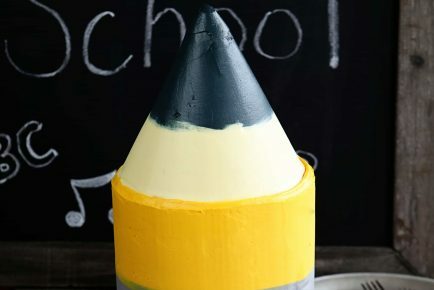 Now hold the #352 tip flat against the tower of frosting and apply pressure as you move up. Release pressure at the top and quickly pull the bag away. Repeat. Now grab the bag with white frosting and the #3 tip. Right on the edge of the green frosting apply a dot of frosting and quickly pull away. These white dots represent the needle on a barrel cactus. I made mine farther apart on the bottom and grouped them closer towards the top. Do this around the entire cupcake. Finish with a yellow flower on the top of the frosting cactus. Pipe out a small mound of frosting in the center of the cupcake. Starting at the base of the frosting, squeeze a row of tiny star shapes all the way around the cupcake. 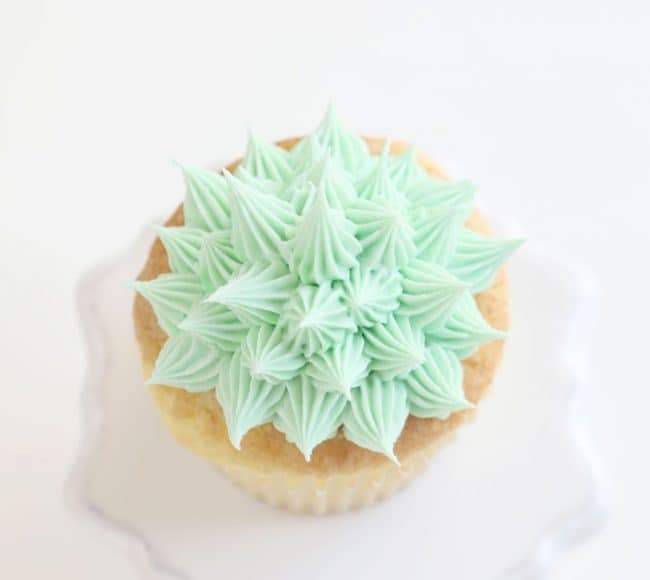 Once you have one row of spikes, continue moving up and around the cupcake until you reach the top. 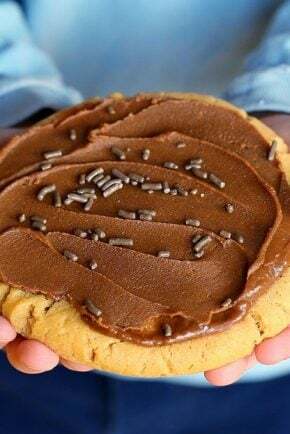 For this version, you will prepare your frosting a bit different. I added both green and pink frosting to one pastry bag. Press an empty pastry bag into a tall kitchen glass. Spread some pink frosting along one side of the bag and then fill in the bag with green frosting. With the #32 tip, pipe out a small mound of frosting in the center of the cupcake. Starting at the base of the frosting, squeeze a row of tiny star shapes all the way around the cupcake. 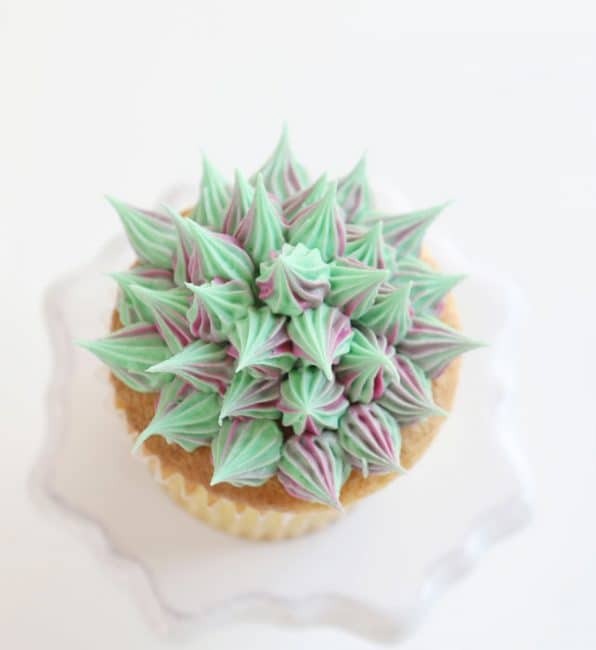 Once you have one row of spikes, continue moving up and around the cupcake until you reach the top. Starting at the center of the cupcake, pipe a small mound of light green frosting. 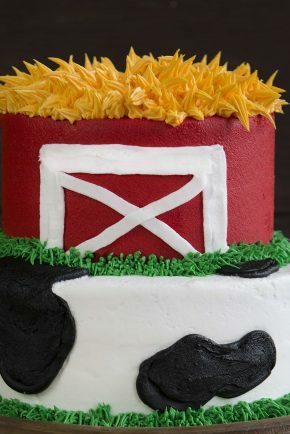 Now hold your tip at the base of the mound and apply pressure, moving over the top of the frosting mound. Rotate your cupcake 1/3 way around and repeat. Rotate cupcake another 1/3 way around and repeat. It should resemble the tighter inner petals of a rose. 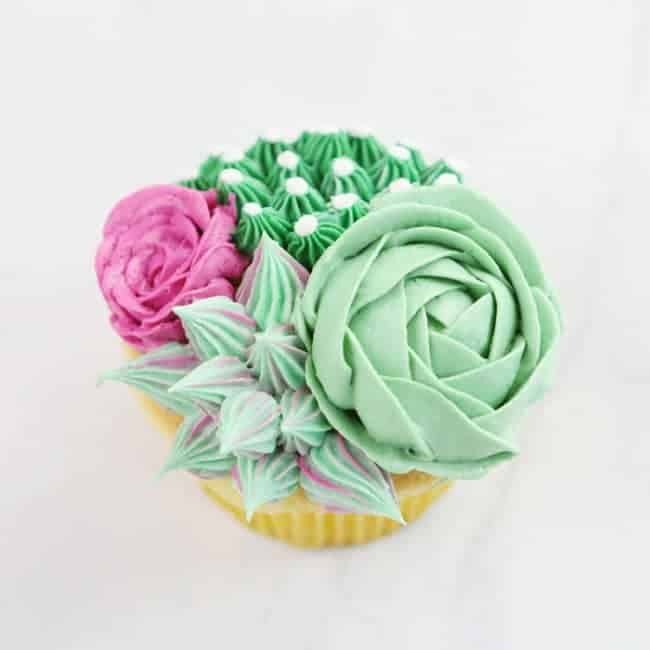 Now, starting at the base of the frosting, apply pressure and move upward slightly over the frosting and pipe another petal. Repeat a few more times and then switch to the medium green frosting. 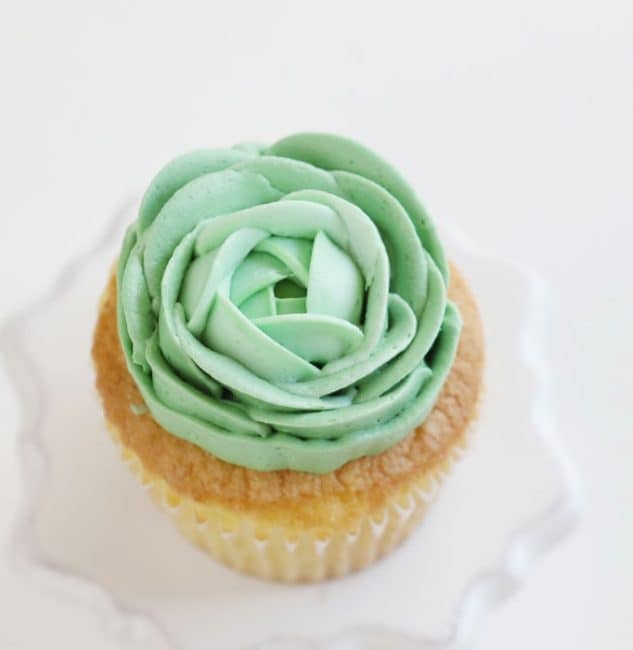 Repeat with the petals around until you almost reach the edge of the cupcake. Now hold the tip against the cupcake and pipe around the entire flower. This is optional but can help create a cleaner edge around the base. After making a few of each design, you will have a strong grasp on how to execute them in different ways. Try with different colors and add different tips… the sky is the limit! 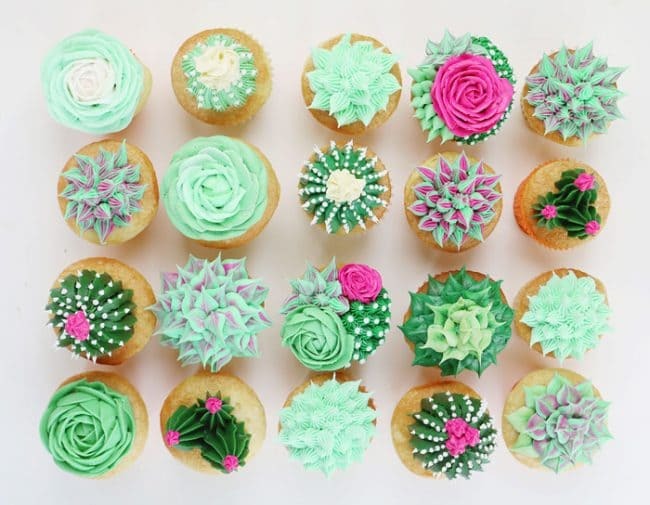 These Succulent Cupcakes are a really delicious way to impress friends and family. These are so neat!! You are so talented. You are so talented. Love watching you make your creations. These are so neat! You’re so talented! What a fun idea. My daughter loves succulents, she would love these for her birthday. 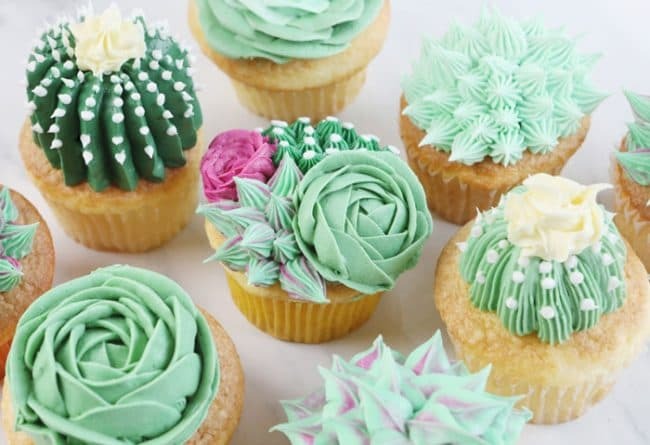 These Succulent cupcakes are a fun to way treat anyone who loves succulents! Imagine inviting the kids to help and creating memories as well as delicious cupcakes! I would love to follow you. 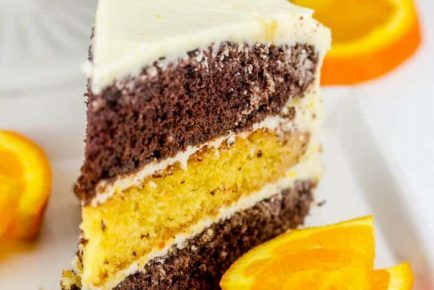 Do you give recipes for your icing? I am having a hard time with my frosting not being stiff enough to use the piping tips. My hand is also warming the frosting so it melts in the bag….help!!!! 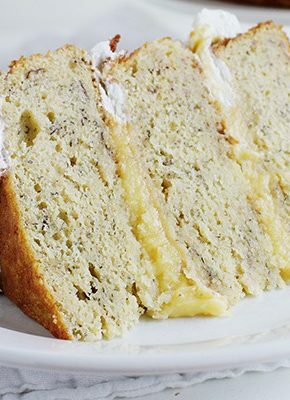 Try adding a bit more confectioners sugar or chilling the frosting in the fridge for about 15-30 minutes. These are beautiful! Can you tell me how many cups of frosting to prepare for 24 cupcakes? Can you share the food coloring mix you did to get the mauve color? It’s perfect! I am just starting my own business making candy apples, cakes and things. I am also trying to get into the infused cakes and this helps me a lot. I am trying to get creative and it takes a while but thanks for the inspiration. I’m having a hard time finding the tips you used. For example #352 is a leaf tip, but should it be a big open star for the large dark green cacti?